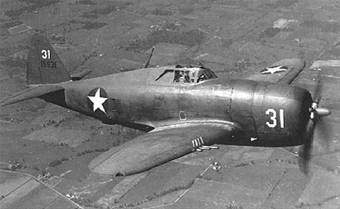 On August 27, 1943, a pair of P-47 Thunderbolts was passing over the Hatfield area when one aircraft, a P-47B, (Ser. No. 5930), developed engine trouble and the pilot was forced to bail out. The aircraft plunged into a wooded are in North Hatfield near the Whately town line and exploded. Some nearby field workers had to scatter as the flames set off ammunition in the aircraft. The pilot landed safely. Both aircraft were part of the 320th Fighter Squadron, 326th Fighter group, based at Westover Field in Chicopee, Massachusetts. Source: Unknown Newspaper, “Westover pilot Jumps Out Over North Hatfield”, August 28, 1943.